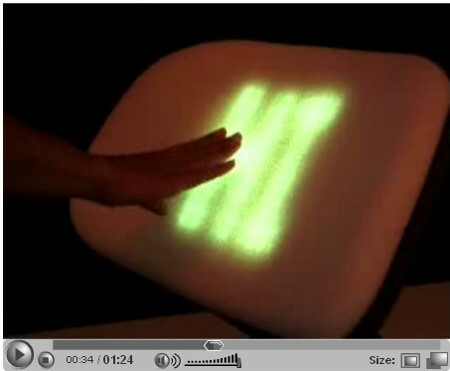 Lumalive fabrics feature flexible arrays of colored light-emitting diodes (LEDs) fully integrated into the fabric - without compromising the softness or flexibility of the cloth. These light emitting textiles make it possible to create materials that can carry dynamic messages, graphics or multicolored surfaces. Fabrics like drapes, cushions or sofa coverings become active when they illuminate in order to enhance the observer’s mood and positively influence his/her behavior. The jackets are comfortable to wear, and the Lumalive fabrics only become obvious when they light up to display vivid colored patterns, logos, short text messages or even full color animations. The electronics, batteries and LED arrays are fully integrated and invisible to the observer and wearer. The jackets feature panels of up to 200 by 200 mm², although the active sections can be scaled up to cover much larger areas such as a sofa.